The Invincibles, for much of the Irish people today, are a misunderstood and nearly forgotten group. They arose from a period of major social upheaval in late 19th century Ireland, known as the Land War. This was a time of both violent and non-violent agitation, fought between opposing forces of power. Privilege on one side against the poor and marginalised on the other, the outcome of which would ultimately be a shift in the ownership of the land in Ireland from landlord to tenant. The Irish National Land League, was formed in 1879, by the former Fenian Michael Davitt and the constitutionalist Charles Stewart Parnell, to direct this agitation. In response, the British government introduced repressive Coercian Acts, imprisoning many of those involved in the Land League. Michael Fagan was originally from West Meath, but lived and worked in Dublin as a Blacksmith. He was twenty-four years of age, and by the time of his execution was living at artisan cottages in Dublin’s. He was a leading figure within Dublin Fenianism and had acted as a centre of a Fenian circle previously, connected intimately with his fellow Invincibles James Mullet and Daniel Curley. Pleading not guilty to murder at the trial, it is said Fagan often laughed during the testimony of the hated informer James Carey - who as we know, suffered a dramatic, violent end as a result of the betrayal of his comrades. Fagan was executed by hanging on 28 May 1883 in the grounds of Kilmainham Gaol. Incredibly, he remains there buried today along with the other Invincibles executed Joseph Brady, Daniel Curley, Timothy Kelly and Thomas Caffrey. That all five men remain buried in unmarked graves in Kilmainham Gaol, nearly a century after it has ceased function as a prison, should be seen by all republicans as nothing less than a disgrace and shameful to the heroism and sacrifice of these men. It is worth now bringing to attention, the campaign by that great commemorative organisation, the National Graves Association. The NGA was founded by republicans in 1926 and dedicates itself to the upkeep and maintenance of the graves and memorials of all those who given their lives for the cause of Irish freedom. The NGA have formed a committee which has recently launched a campaign to win support for the removal of the remains of all five of the Irish National Invincibles from the prisoners’ graveyard in Kilmainham Gaol to somewhere more befitting of their status and sacrifice. I would urge all of you to go online to the campaign’s Facebook page and register your support for their campaign, this is most certainly a campaign all republicans can get behind. It is always important to remember and pay tribute to our martyred dead, particularly in what seems like a prolonged period of difficulty and soul-searching for those of us who make up the ranks of Irish republicanism. 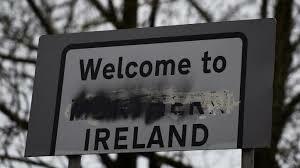 This year, it will not have escaped the notice of anyone, the shallow and conniving political classes across Ireland and Britain on our television screens paying seemingly endless tribute to the so-called Good Friday Agreement on the twentieth anniversary of its signing. That this was occurring at a time of profound political dysfunction at the heart of the northern statelet, against the backdrop of the turmoil over Brexit, was simply laughable. Of course, we as republicans know that profound political dysfunction is nothing new for the Six-County State, from its creation under the hated Government of Ireland Act 1920 or indeed, now. That the reformist political project of Constitutional nationalists to achieve Irish unity through the partitionist parliaments of Stormont and Leinster House is nowhere close to this aim is of no surprise. Nonetheless, we are told this is ‘peace’. No-one present here today does not desire a more peaceful and just society, but that is certainly not the case of Ireland in 1998, nor Ireland of today, Republican activists can testify to this. It is hardly a shocking observation to state that the challenges that we republicans face in 2018 are huge. Not a year seems to pass, when another noted republican activist is arrested in the 6 counties and held on evidence their own defence teams are not allowed access to. We recall well the instances of Marian Price and Martin Corey, and at present, Tony Taylor remains interned for nearly 800 days. In the free state, it is the mere verbal statement of a Garda superintendent that can have men and women arrested on supposed IRA membership. How can anyone say we are living in a more normal, indeed, more peaceful time? How can anyone honestly say that Irish republicans cannot and should not legitimately question and campaign against this state of affairs? 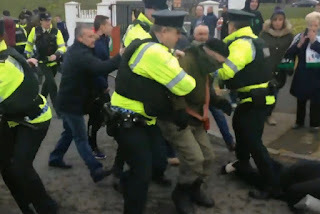 Whether it’s the RUC attacking a republican commemoration this year in Lurgan, or the continued humiliation of the ‘Hooded Men’ in their quest for justice, everywhere we turn are dark and shadowy forces determined to obstruct Irish republicans in merely suggesting to the Irish people that there is a valid and better political alternative. I think it is safe to say we can all agree this state of affairs is not normal. And it certainly is not ‘peace’. I recognise that huge differences exist between groups within republicanism, whether that is due to historical reasons or matters of personality. But it is important to recognise that despite the fragmented nature of Irish republicanism, we surely all share firm principles as well as commonalities in our goals - and when the banners and flags are put away from our commemorations, the work must continue. We must allow time to meet and listen, discuss how we can unite, strategise and campaign on issues relevant to us, all serve to advance the cause of Irish republicanism. It cannot be a case of simply reacting to social issues of the day and following other non-republican groups that offer vaguely progressive, or reformist short-term solutions. These groups often lack the goal of a united and independent Ireland that will radically transform the lives of all Irish men and women. 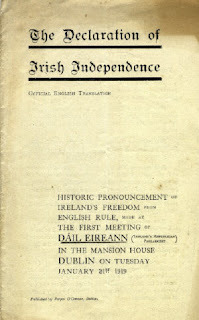 Irish republicanism must take the lead in achieving this aim and present solutions within a progressive, democratic-socialist, and above all, republican programme that puts the independence of this country at the forefront and explains how this will vastly improve the lives of everyone in this country for the better. Let republicans begin to have this discussion. I myself of course make no secret of favouring a campaign for a federal united Ireland, favoured and devised in the past by iconic republicans like Ruairí Ó’Brádaigh and Dáithí O’Conaill. In conclusion, we remember today Michael Fagan, and the Irish National Invincibles, but we remember too that they did not arise out of vacuum - nor was their action in the Phoenix Park that of a random murderous act, it was of a political nature and a revolutionary mindset, that reacted to a time of unprecedented social upheaval in this country brought about by the British colonial rulers in this Country. British rule is still with us in Ireland today, the very idea that a Country in 2018 is still under firm British Rule is a throwback to the days of empire and noted as out of date and deplorable by most of the modern world. The challenges of our times are in many ways different from the Land War period, any methods we employ will most likely differ from Michael and his comrades, but let us never cease to be inspired by their heroic example and memory as we move forward, and it is forward we must go, there must be no backward steps.